Åre early in the morning seen from my hotel room. It was a Fuji X100 that in 2012 was one-half of the cause to start my photo disease. That is the sickness in which one is driven to take the next bold photo. The X100 had two major limitations, which meant that I didn’t use it terribly much. First of all, the sensor was 12 megapixels, which was only just enough. And not enough for cropping. Second, it only did -1, 0 and +1 in bracketing, which is rarely enough to shoot the HDR scenes that I shoot. But when the X100F got out, I was happy. Finally – 24 megapixel and -2, 0 and +2 autoexposure bracketing, and still the amazing image quality. I bought it instantly and I love it very much. The smallest camera I have, fast and amazing image quality. I have used that diligently since then. 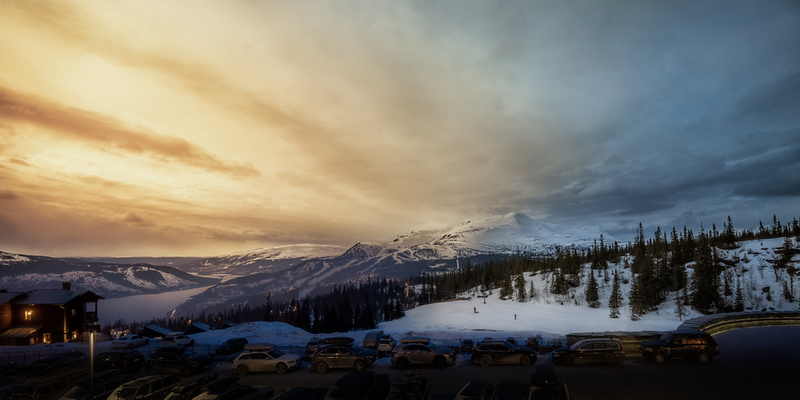 I shot the image on top, with my X100F from my hotel room in Åre, Sweden. It is a panoramic picture consisting of 3 pictures. I actually had much bigger ambitions with this image than I managed. I would have made a ‘compressed time’ picture, in which I merged pictures together, to show time from when it was completely dark until it was bright. But, the fantastic little X100F came in short. Funny, because it can easily take time lapse pictures for hours. Even bracketed. The camera also has Manual focus, which works great by the way. First I tried using autofocus, but fair enough, it was nearly pitch dark. The camera could not focus. Instead, I switched to manual focus. But it made a funny mechanical sound after each photo. After having lied in my bed, I eventually got up and checked. All of the images where slightly out of focus. Then I looked out of the window and thought ‘this is pretty damn nice – I will just shoot a panorama’ – and the result is at the top. A night I picked up my Nikon D800 and put that up for time lapse photography. The good old real DSLR does not play any of the funky electronic games. This image below is 5 hours compressed into one image. Åre in Sweden in a time compressed photo.